Refinishing kitchen cabinets is an excellent frugal alternative to installing new cabinets, which can cost thousands of dollars (say what?!). While I won’t lie to you–this is a time-consuming endeavor–it yields a major impact and isn’t difficult! It’s such an inexpensive alternative to completely renovating a kitchen and you could get creative with colors. This is probably my favorite frugal home improvement. We went with white because we already have grey walls and a green backsplash and I didn’t want to end up with unicorn colors. Frugal tip: it’s expensive. Don’t buy it unless you really need it. Frugal tip: use old plastic food containers. Frugal tip: we cut old t-shirts into rags. Step 1: Empty out the cabinets. We found it easiest to remove everything from the cabinets so that we weren’t worried about getting paint on plates and the like. Bonus: fun time to re-organize your cabinets! 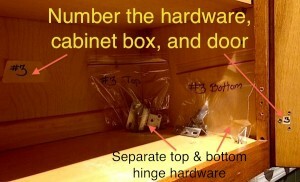 Step 2: Remove hardware from cabinets. Our cabinets and drawers have identical handles, so there was no need to label what went where. If you do have different handles and knobs, you’ll want to label each one. Frugal tip: hardware is gigantically expensive, so if you can re-use your existing hardware as we did, you’ll save a bundle. If you hate the color of your hardware, you could spray paint it as I did in one of my furniture refinishing projects. Step 3: Score tops and bottoms of all hinge hardware. Before you remove the cabinet doors, use a box cutter to score the wood at the tops and bottoms of the hinge hardware for each door. 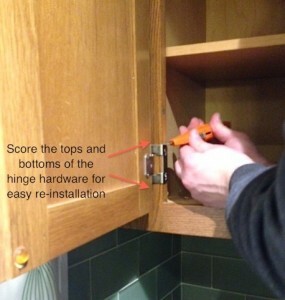 This makes it easy to align your hinges when re-installing. Step 4: Label all cabinet boxes, cabinet doors, and hinge hardware. 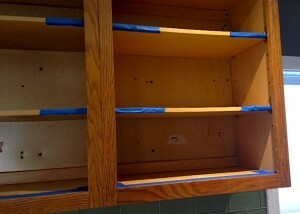 Step 5: Remove cabinet doors. You’ll be tempted to yank all the doors off ASAP, but wait! I promise you won’t regret carefully labeling each one. Remember, you have to reverse engineer this project in order to get the doors back ON when you’re done. 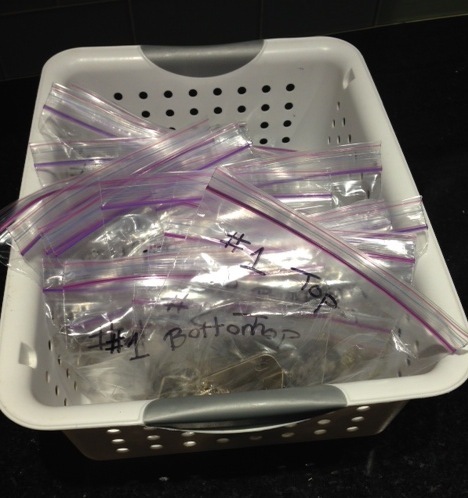 After you’ve scored each hinge (see step 3), remove the hinges using a screwdriver and place hardware in separate labeled ziplock bags for top and bottom hinge hardware (initially I planned on doing a cutesy labeling system using song lyrics (?!? ), but Frugal Husband gently pointed out it’d be easiest to just use numbers. Sigh.). Next, label the corresponding cabinet box (fancy name for the cabinet itself) with the same number as the corresponding hinge hardware. My high-tech system involved masking tape and a marker. 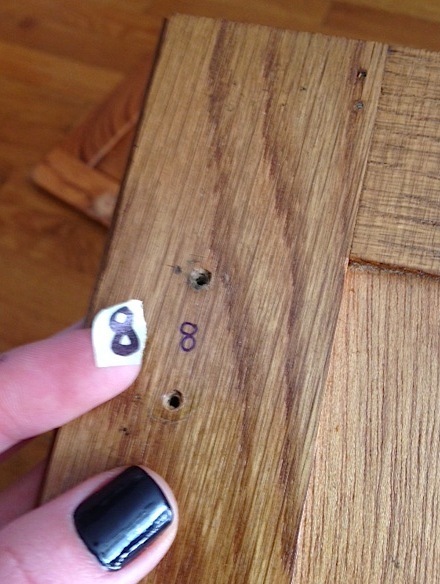 Write the number on the door itself underneath the spot that’s covered by the hinge hardware. Use a tiny piece of masking tape, with the number written on it, to cover the number up. That way, you can roller paint over the masking tape and later remove it to reveal the number underneath. Woe betides the painter who paints over her cabinet door number. Let me just tell you: once you get those doors off, it is REALLY unclear which door goes where and also which end is up… no joke. I wrote a lot in this step for a reason: you realllllly don’t want to fumble around with hinge hardware and doors after you’ve done the hard work of painting. You want to reinstall the dang things and take your after photos. So, do your future self a solid and label like a fiend. Keep track of all your hardware! Step 6: Set up your work stations. You will be a happier little camper if several people work on this project. Since the cabinet doors are mobile after they’re removed, you can run zone defense (omg sport metaphor!) and divide up the labor. Step 7: Determine the scope of your painting. Frugal Husband and I, being both lazy and pragmatic, decided not to paint the interior of our cabinet boxes or drawers. Our interiors are a light-colored wood and we decided it doesn’t bother us. This choice is entirely yours and if you do paint your interiors, you’ll need to allot more time for painting. We do recommend you paint all four sides of your cabinet doors. Let me break it down for you: it would look straight-up tacky if you didn’t. Frugal tip: you’ll use less paint if you don’t paint the interiors. 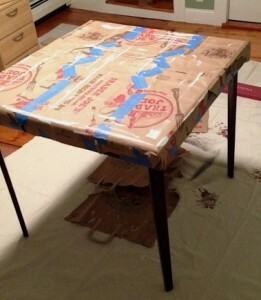 Step 8: Tape and drop cloth your kitchen. 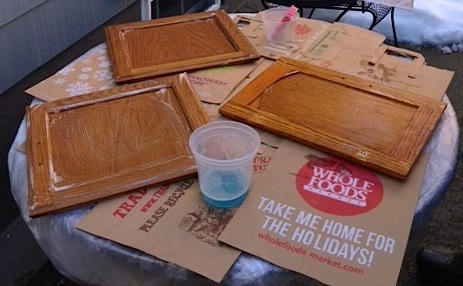 Since we weren’t changing our backsplash, floors, appliances or countertops, we did not want to spill paint! And, as previously disclosed, I am a freaking messy painter. I used painter’s tape to meticulously (read: mind-numbingly) tape around every cabinet box (walls, backsplash, oven hood)–whatever touched a cabinet that wasn’t another cabinet got taped. 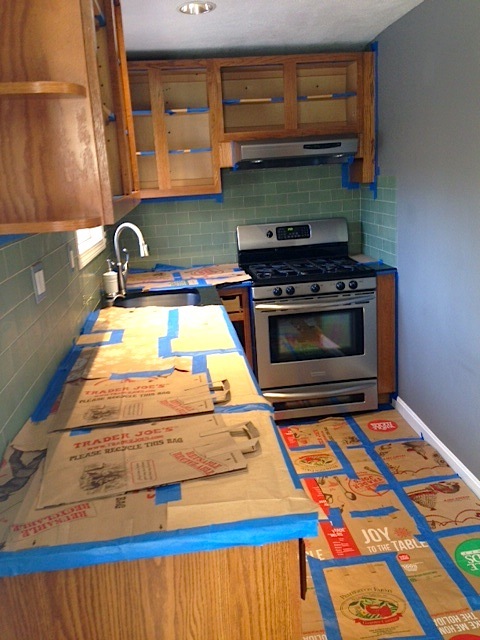 I covered the kitchen floor and countertops with paper grocery sacks. Frugal tip: taping and covering surfaces ensures you won’t incur costly clean-up projects. Tape and cover it all! Step 9: Clean cabinets, drawers, and doors with a liquid de-greaser. This step is vital with kitchen cabinets since they accumulate cooking and hand grease from frequent use. We wore disposable latex gloves and carefully poured a bit of TSP Substitute onto rags and then rubbed it onto the cabinets to clean them. Wipe in a circular motion over all surfaces (think: wax on, wax off). 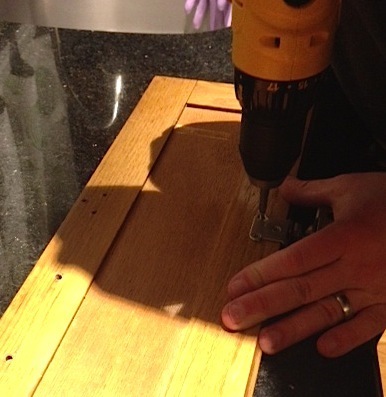 Step 10: Use a liquid sander/de-glosser to remove finish on cabinets, drawers, and doors. This stuff is pretty nasty, but, it works miracles. MIRACLES. Definitely wear gloves and open all the windows and doors for ventilation! Hounds should run for cover. Pour a small amount onto a rag and then go to town on the cabinet boxes, drawers, and doors. This was so effective we didn’t need to sand with sandpaper–the liquid sander removed plenty of the top layers of finish and gloss. Like it said: do you believe in miracles? Step 11: Let the liquid sander/de-glosser dry. Don’t wipe it off with water or anything, just let it air dry. Completely. Great information! We have flipped houses before and we could have saved a ton of money by doing this instead of buying $5000 of new cabinets. I’m bookmarking this for our next flip. Glad to hear this is helpful! It’s definitely a money-saver over new cabinets. Best of luck on your next flip! So I’m a bit late here but oh man, this is perfect. 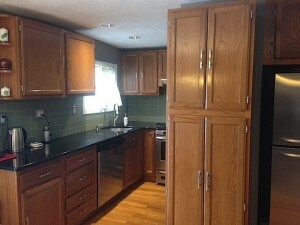 We have basically the same (dated) wood cabinets as you started with! I know they say not to paint over wood but that’s ALL WE HAVE EVERYWHERE. Wood floors, would cabinets, our dining set is wood. 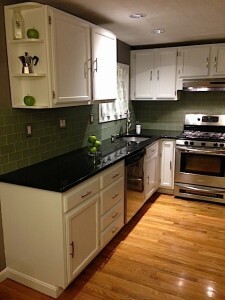 I’d like a bit of color changes and we had talked about painting our cabinets white! Yeah, I’m with you–wood is nice, but not when it’s wall to wall! 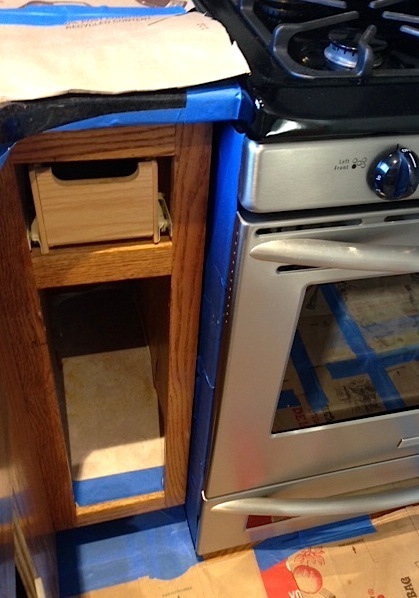 We’ve been really pleased with the results of painting our cabinets and it’s not too difficult of a process. You should do it :)! We are about to tackle refinishing our kitchen cabinets. I have read multiple tutorials on the subject, and was wondering if that deglosser really works.. I guess my question is, have you had any chips in the paint since the project was done? And thank you for the amazing tutorial! 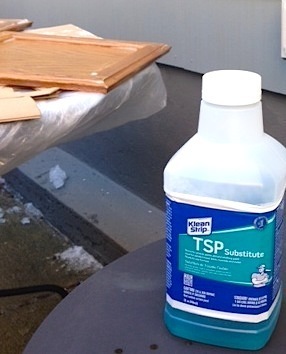 When re-doing your kitchen cabinets did you use 2 products: Kleen Strip TSP Substitute AND Kleen Strip Deglosser or just the deglosser? Getting ready to do this and want to do it right!! I haven’t started our project but have read many, many tutorials. Definitely recommended that the cabinets be cleaned with a product. I had not heard of the TSP Substitue but have read of others available at Lowe’s. Secondly, the de glosser is the next step which is supposed to give good adhesion of paints. So, a 2 step procedure. Thank you! This is an amazingly detailed post and SO very helpful! This is helping me in 2016 and is by FAR – the best write up I have seen with great tips. We have the exact same cabinets! My only detail I would love to know is if you remember the gloss finish of the Benjamin Moore “super white”, and how are they holding up after over a year’s worth of duty with no varnish coats? They’re holding up great and it has actually been almost 3 years :). Sorry, I can’t recall what the gloss finish was. Is this deglosser suppose to be sticky? Great job! We’re looking at doing the same and going with Super White! Was curious what brand paint brushes you used – Purdy or Wooster? Something else? I’ve heard the brushes you get do make a difference. 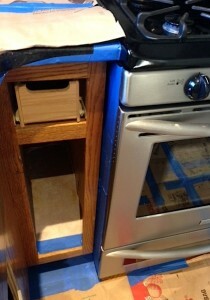 Also, a curious if I need TSP if our existing cabinets are only stained and varnished (no paint). Will Jasco varnish & stain stripper be enough to clean everything off as-is?